It has been a week since Governor Murphy signed a $15 minimum wage into law and the voices of frustration and concern from our small business community have never been louder. Your uneasiness is justified and expected. For years, you told us what the impacts of such a large increase would be: a reduction of staff, hours or benefits; the raising of prices; the increase of automation. Some of you told us you would close or relocate. We presented all of this and more to our lawmakers. Unfortunately, the final bill lacked the much-needed mitigation that would have made the inevitable pathway to $15 an hour more tolerable to your bottom line. I say inevitable because our Governor ran and was elected on the promise of a $15 minimum wage, and our legislative leaders have been advancing this action publicly for the past few years. Now that this law is in place and you must plan to address its impact, NJBIA has put together resources to assist you. On Thursday, Feb. 21 at the Hotel ML in Mount Laurel, we are holding a Preparing Your Business: $15 Minimum Wage event. This is an opportunity for you to hear from experts on potential ways to mitigate this payroll mandate. Before you rush to any personnel or fiscal decisions, we encourage you to join us to hear some strategies that may help you to avoid major paradigm shifts in your business model. You’ll also get better insights on your legal requirements from our panel of experts. In addition, to answer your questions we will be posting “Fast Facts” on our website over this next week and we have our legal hotlines available to you as well. 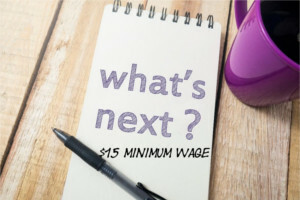 Finally, we continue to seek input on the actions you’re taking now and into the phasing in of the law in July ($10 an hour) and again in January 2020 ($11 an hour). We will continue to relate these impacts in real time to our policymakers who have assured us that they will be mindful of the unintended consequences of this new law. The more information we have, the better armed we will be to seek corrective legislation on your behalf. Please send your emails to us at minimumwage@njbia.org . As always, your input is a vitally important part of our ability to take action. In the meantime, I look forward to seeing you on Feb. 21 in Mount Laurel. I’m starting to plan to my escape from this socialist state. NJBIA has no real power or influence here so this is a waste of time. No room for free market capitalism here. Bye.